The Honda NSX was launched in 1990, amazingly the timeless classic still remains in production today and long may it continue to do so. Revelled by all that have had the privilege of the driving the NSX, it is a truly incredible Supercar and unlike offerings from other manufacturers it has no turbos nor does it have a collosal displacement to assist its cause. The simple formula employed by Hondas technicians was to build a car formed of a rugged but lightweight construction, clothed in a lightweight body and housing a highly tuned normally aspirated engine. Chassis development was thorough and even included significant input from triple Formula One champion Ayrton Senna (all three of his titles were won in Honda-powered machinery), the end result is remarkable. With a successful Formula One program already in progress, Honda opted not to race the NSX initially. The works-entered NSXs first graced the racetrack in 1994 and since then it has achieved much success, taking numerous victories across the globe particularly in the Japanese GT Championship where a Honda NSX took the title laurels in 2000. When the factory decided to commence the NSX race program they commissioned the renowned chassis constructor John Thompson of `Thompson Composites’ to build the race chassis’ (in both GT1 and GT2 form) from a mixture of state of the art Carbon-fibre and aluminium. This car, GT2 chassis number 1 was prepared by the ultra-successful Kremer brothers and raced in the German GT Championship in 1994 where it took 5 pole positions, took three wins and finished 2nd overall in the championship standings. It also competed at Le Mans in 1994 when it was piloted by Armin Hahne and former Le Mans victors Christophe Bouchot and Bertrand Gachot and after a steady run it was placed 14th overall and 5th in the GT2 class. 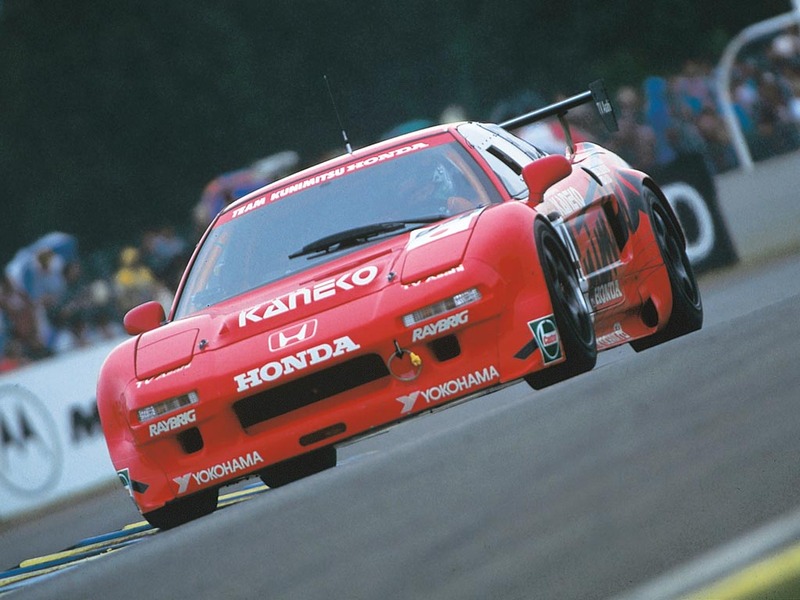 It was then entered into the 1995 Le Mans event by seasoned Japanese campaigner Kunimitsu Takahashi and was the only GT2 NSX entered alongside two turbocharged GT1 NSXs. Despite starting the race late and 6 laps down the Japanese trio of Keiichi Tsuchiya, Akira Iida and entrant Kunimitsu Takahashi drove an inspired race to erode the deficit and took GT2 class honours and 8th position overall ahead of the Corvettes and the usual gaggle of Porsches. After the race, the car was put on display in a Honda showroom and it remained there until 2000. With the financial backing of Honda Germany it was then decided to run the car in German endurance events. Christies sale of #001During their sale of Motorcars on December 2nd 2002, Christies auctioned the first factory NSX with an estimate of $120 000 to $ 170 000 USD. Fortunately the high bid was able to meet the reserve price, and the car was sold for 115 250 GBP or $198 470 USD.